The season of indoor classic car exhibitions has begun, and yours truly has been out to have a closer look at the new kid in the class. The 13th to 15th October saw Hamburg get its own classic car exhibition, and this north German city is naturally ideally situated for us Danes as well as all the rest of northern Europe. I especially found it rather interesting that the new venue were promoting themselves as going beyond just classic cars, as there had been talk of lifestyle and even the world of art. Because let’s be frank: I too had worried somewhat as I considered just how many classic car exhibitions there is a market for in northern Germany? Seeing as both the exhibition in Bremen and even more so Techno Classica in Essen are obviously very well established. For that matter, there’s not really terribly far to travel to either The Netherlands or Belgium either, who also have their own classic car exhibitions. It really started out rather well in the parking area. However, that potential new aspect did unfortunately disappoint a bit: Other exhibitions also have a wide offering of accessories surrounding the broad world of classic cars – right from driver’s gloves to suitable duffle bags and suitcases. Hamburg offered this too, but failed to exceed the competitors. Via a 3D scan of your feet and manufacturing directly from the scan these handmade shoes sold for around 300 Euros. Ah, those classic cars. With the exhibition having come to an end, they sent out a press release stating that it had proven a massive success. Granted, 17,000 visitors over three days is not bad at all for a new show. But the original plans were to fill four exhibition halls, and as such they certainly failed to live up to expectations by merely filling two halls. The icons were there too. Therefore, I – just like most others – had expected it to be bigger. Usually I find it all too easy to immerse myself in a good classic car exhibition, but after just four hours I had been through it all – even without rushing myself. It’s surely the first time in multiple years that I have spent less time in an exhibition than I had planned for. German exhibitions can literally be flooded with Porsche and Mercedes, but I felt Hamburg had struck an OK balance. Naturally though, there were still plenty of wonderful classics present. In the more exclusive hall, they had assembled all the obvious dream classics: Miura, Gullwing and a few Ferraris just to up your pulse a bit. It worked too. But the more obscure classics were rather thin on the ground. The tribute area to Hamburg’s own motor industry was very well executed though, and I believe it’s the first time ever I’ve found myself dreaming of a Tempo pickup truck. The coolest combo of the show: A Tempo light truck carrying a Maserati Voiturette race car. I really appreciated the typically German and very systematic parking of classic cars between the two halls. Here cars were a mix of classics for sale and privately owned classics which visitors had arrived in. I did regret not driving down in my own classic, especially as I meet another Dane who had done just that. Maybe next time then. The line up of classic cars parked betweens the halls worked very well and I would like to be here myself next time. As despite everything, I could very well revisit Hamburg next year. I have now levelled my expectations. The exhibition is not as big as I had thought, but the atmosphere was pleasant, and there were plenty of interesting cars, of which many were of course for sale. Still, the Bremen Classic Show (2nd to 4th February 2018) is still both better and bigger, but being three months later you could well be visiting both. Also, if all really went as well for the organizers (and the exhibitors, not least), as their press release claims, then the exhibition will clearly be bigger next year, which is of course more incentive for us all to attend. The dates for 2018 will be the 19th to 21st October, and I’m pretty sure I’ll have a Hamburg visit in my planner for then. Just like Berlin who held their classic car exhibition earlier in October, the surrounding city of Hamburg provides plenty of temptation in its own right. My Car Lounge is a new concept for storing cars, opening in Hamburg next year. 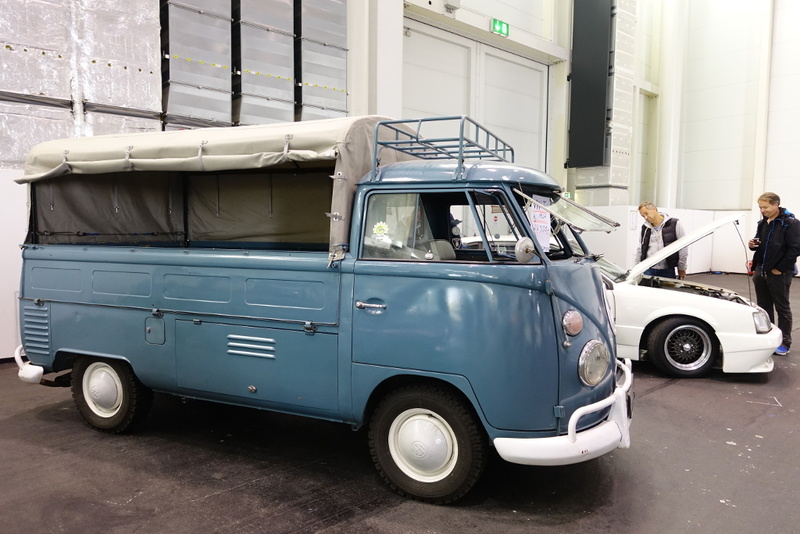 As for high-end classics, there were a whole lot more of them in Hamburg than at this weekend’s Danish exhibition in Fredericia – goes without saying really. But if you’re on the hunt for a budget classic, then Hamburg was not really the place. Sure there were some to be found, but they were far and few. There was one particular classic though, which I did spend a fair while considering whether I could possibly come up with some sort of a reasoning to include into my garage – an Opel Monza GSE. This classic speed boat was immensely cool in its green GRP. Included in the price of approximately 6.000 Euro were period water skies – and the trailer. Not only did this 1984 Monza have the rare and sought after manual gearbox, but it was also sporting a period Mattig/Mantzel build complete with wide arches, sidepipes and mild engine tuning. Utterly Eighties in its white paintjob, presented in good condition, and only for sale because the private seller had two other Monzas. I was so verliebt in the Monza that I forgot to take some photos – but there it is, behind the Bus! Some casual chat had the price down around the Euro 6,000 mark, which seemed quite fair for the big sporty Opel, considering just how unique this Monza was. I even got so involved talking with the owner, that I totally forgot to snap a few decent pictures of it, but it hasn’t yet left my thoughts. The hall with cars for sale from private owners turned out to be a mix including dealers. But the photo is not doing the mix justice: It was far from only VW and Mercedes. But I’m sure there will be heaps of other temptations, as the exhibition season has only just begun. Which in itself is perhaps just a tad early, seeing as we’re still enjoying a spell of very mild autumn weather here in Denmark, inviting our classics out for a few more good drives before winter sets in. Don’t we all suffer from that need to get out every so often? Mine is so profound that one exhibition is far from enough. Later this autumn I will be reporting from Bruxelles, and I’ve also had an invitation to Birmingham from our man in the UK. There’s the charming exhibition in Padova this coming week, and we can’t forget the prolific show in Essen either. What say you? Which exhibitions will you be visiting this coming season? And if you were in Hamburg, what was you impression? You can’t tease us with talk of the bargain Monza then deprive us of photos!!! Can’t you pop back, see if it’s still there? I know, I know – but I was so taken with it that I forgot the photos! The car was nice, though. Yep, that’s pretty terrible photograph of a Monza! Love the interior of that series 1 Esprit. I know – I got carried away and forgot all about professionalism! There seems to be some sort of agreement that all Montreals should be advertised around 80.000 Euros and this goes for these two as well. But there would be some satisfaction for my part in choosing the very unspectacular grey when parting with that sort of money :-). I’d then put it on a set of Momo Vegas just to underline my point of discreet badness! I too would be terribly tempted to go against the flow and chose the light grey Montreal. However, I’m sure we’re not alone on that one. But not many seem to approve of Momo Vegas on a Montreal, yet it has always – as in ALWAYS – been my dream to own not just a Montreal, but a Montreal (regardless of colour) sitting on a set of Vegas. It just looks so right to me, and way better than the stock Cromodoras.